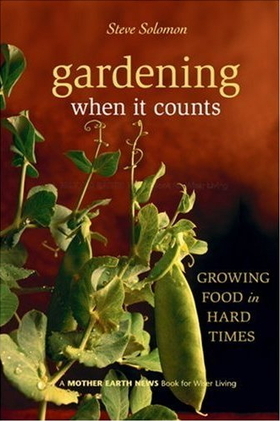 Steve Solomon's Gardening When It Counts: Growing Food in Hard Times is the opposite of Square Foot Gardening in almost every way. While Square Foot Gardening is aimed at the suburban hobby gardener, Gardening When It Counts is written for the serious homesteader. I complained about pages of fluff in Square Foot Gardening (which Ron rightly reminded me was useful information for the beginning grower), but I wish Solomon had spent twice as much space on many of the topics in his book. I'm going to attempt to hit the highlights of Gardening When It Counts in a special, two week lunchtime series, but like my series on Growing Gourmet and Medicinal Mushrooms and Edible Forest Gardens, I highly recommend that you check the book out of your local library and read it from cover to cover. Twice. If I'd read Gardening When It Counts two years ago, I would have saved myself a solid year of experimentation. You can save that year! Want to quit your job and make a living on the land? Check out our microbusiness ebook. I have this book and was disappointed to find Solomon's disparagement of the urban gardener in the first few pages. For homesteaders, no doubt this book is fantastic but for those of us in the city, Lee Reich's Weedless Gardening and Rosalind Creasy's books are a better bet. I agree --- Gardening In Hard Times is definitely not set up for backyard gardeners. To me, that's what makes it so powerful --- there are so many books out there already for that niche, but if you're running a larger operation, your choices come down to picking out what you can use from books like Square Foot Gardening or buying into the corporate mindset in mainstream agricultural publications. I don't want to sound like I'm dissing urban homesteading, though. I'm thrilled that people in cities and suburbs are becoming more self-sufficient! But, you're right that urban homesteading requires different techniques, ones that often don't make much sense on my farm. Gardening in Hard Times is a perfect fit for my farm, and is definitely worth reading for people with acreage. Thanks for the book recommendations! I adore Lee Reich, but haven't read that one yet. What would you recommend as a good gateway Rosalind Creasy book? I'm reading this book at the moment, and really getting a lot from it. I disagree that it has nothing for "urban homesteaders", well "suburban homesteaders" anyway. "Urban" implies even less space. It really comes down to how much space you have and what you're trying to do with it. Gardening When It Counts is a system optimised around maximum output for minimum time and cost, where you're not particularly constrained by the growing area available. He talks on the scale of 2000 square foot (200 m2) gardens and 100 ft2 (10 m2) beds - that can easily fit in a 1/4 acre block, but not in significantly smaller properties. He lays out the gardens to minimise time spent weeding and watering, by spacing the plants out and giving ample room between rows to get a hoe in. Square Foot Gardening is a system optimised around maximum output for minimum space, where time and cost are not so constrained. It talks on the scale of maybe 200 ft2 (20 m2) of garden space, with 16 ft2 (1.6 m2) beds. It pushes the plants as tightly together as it can, using special soil mixes in raised beds, vertical growing frames, and regular manual watering. Even if you're space-constrained, there's a lot of good info in Gardening When It Counts about garden tools and their maintenance, seed selection, raising seedlings, fertilisers, etc. And it'll explain to you exactly what the compromises are when you grow more intensively - Square Foot Gardening didn't do a very good job of that in my opinion. GWIC is a system that would scale up fairly well. For someone like a market gardener, who might have several hours a day to spend in their garden, it would really help them to maximise what they can produce within their available work time. Your description of the distinction between Square Foot Gardening and Gardening When it Counts is much better than mine --- I totally agree. The scaling up matter is another big factor in GWIC's favor. I think that's what turns me off so many of the books like Square Foot Gardening (and even Weedless Gardening) --- they assume you're only going to be growing perhaps 10% of your vegetables and have no wish to grow more. GWIC makes no such assumption. I started reading this book this morning, because of this post, and have found myself having a very hard time with some of his ideas. Honestly, some of it feel like complete hogwash in the face of common sense, but I am not formally educated in gardening chemistry and may not be able to see he's right. I, too, found his disparaging comments in the beginning to be off-putting, but agree that it becomes clear that his methods are not for a backyard space in the slightest. I also agree that there is still valuable information such as his fertilizer, tools, and seed selection. The more I read, the more it becomes clear that the information really is for 'When It Counts' and you have the space. There is a ton to be said about not needing to irrigate because there isn't any crowding going on, certainly something useful to know when water is hard to come by. However, I have a large backyard, but I don't think I can afford to use up so little of the space to grow my own produce. I will take the information to heart and, perhaps, do some experiementing to see how it could affect me more positively than I imagine. Honestly, however, I think it very important to preface the book recommendation with the disclaimer that it is no small-scale endeavor—and highly opinionated—although certainly informative. Anna, I look forward to your future posts about what you got out of the book and, in time, how it will improve (hopefully) your own farm. Brandy --- If you haven't already, you might want to check out the other nine posts in this series, linked to within the green box above. They sum up what I thought were the most important points of the book.